Recombination is a good method for supplying a close alternative to fresh coconut beverages by combining the coconut with water and other ingredients. Over the years, recombination processes have been refined to become more efficient and sophisticated, high capacity systems. Recombined coconut products can be supplied to markets where fresh raw material and coconut beverages are not easily supplied. For recombined coconut milk based products, a coconut milk source is the key ingredient used in recombined beverages. It can range from powders like spray-dried coconut milk powder, to bulk liquids like coconut milk or cream. In general, these products are consumed in the United States, Europe and Oceania markets as dairy alternatives. As such, extra care must be taken to ensure that other ingredients are dairy free as well. For recombined coconut water based products, coconut water concentrate is the key ingredient used in recombined beverages. Usually, coconut milk, cream and water are combined with other ingredients like juices, purees, cocoa, coffee, soymilk and more, forming endless possibilities of recombined coconut based beverages. These ingredients can vary, depending on the drinking quality and target cost of producing the final product. The major ingredients used for recombined coconut beverages are water, additives, coconut source, fats and oils. Water is the major ingredient in recombined coconut beverages. It is essential that the water component fulfils the WHO standards for drinking water. These include the sensory properties, physical, chemical and microbiological considerations of water. The following requirements for water quality are based on WHO guideline values and Tetra Pak specifications (Table 9.1). 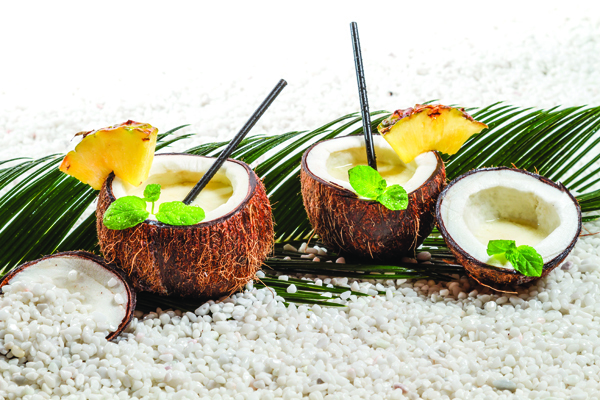 Additives serve several functions in recombined coconut beverages. For instance, the addition of minerals like calcium and fortification with fat- and water-soluble vitamins can improve the nutritional value of these products. In addition, dry additives like sugars, stabilizers and emulsifiers can be added directly into the mixing system for the desired mouthfeel and taste profile. The chosen coconut source can be dry or liquid, depending on the needs of the recombined product. Dry coconut sources, such as spray-dried coconut milk powder, makes shipping, warehousing and handling easy. It is important to get the specifications of the coconut powder used, as some of these powders are not suitable for dairy-free coconut beverages. For example, coconut powders commonly contain the milk protein casein to prevent lumping of the fats during the spray drying process. Liquid forms of concentrated coconut sources are available as coconut milk, cream or water concentrate. These can easily turn into a beverage by diluting the liquid concentrate. Factors to consider are wettability, dispersability, solubility, dairy content and suspendability of the chosen coconut source. The degree of wettability is very much a function of the particle volume. Agglomerated powders have improved wettability because of their increased particle size. This improves capillarity where more water is drawn into the powder particles. This causes the powders to disperse and dissolve faster in water. Good dispersibility is obtained when powders are distributed in water as single particles without lumps. This is determined by the structure of powder particles, as well as the configuration of protein and oil molecules. Solubility is defined by how well the powder dissolves or forms a stable suspension. For coconut milk products, this depends a great deal on how the product is being processed. Suspendability refers to the protein source’s ability to stay in suspension. It is a function of specific volume and particle size. For beverages, maintaining the suspension of protein and fortification like calcium is important. During the recombination process, a specified amount of water is first measured and heated to a warm temperature in the tank. This allows the powder to dissolve more easily. Then, stabilizers, emulsifiers and coconut powder, milk, cream or concentrate are steadily added to the tank. Agitation is applied until all the powder is dissolved, and the resulting solution stands for a period of time. Thereafter, oil can be added into the mixture before it is reheated. If processing continues in the tank, the agitator is switched to high speed for some minutes to disperse the fat and oil. Next, pasteurization takes place. A homogenization step is usually incorporated in the pasteurizer to break up fat and oil globules to minimize creaming in the product. Finally, cooling to packing temperature occurs. In large scale production, recombination plants are built for capacities as large as 20 000 L/h. In larger plants, parallel lines are installed to meet higher capacity requirements. The production sequence in a large plant is essentially the same as in a small one, except that the larger facility requires more tanks for larger volumes of storage, melting of fats and oils, mixing, and buffer storage of the finished product. The degree of mechanisation may also differ. For instance, in large plants, weighing tanks are used to accurately measure the ingredient dosage required. On the contrary, the weighing tank can often be replaced by a dosing pump or pre- weighed dry ingredients in smaller plants. In large scale production, a high-speed blender is used to mix dry ingredients first. The dry blend is then dispersed into the water through a hopper that operates at a rate of up to 45 kg per minute. When all the powder has been added, the contents of the tank are left to stand for hydration of the powders. Meanwhile, the blender is fed with the next batch of dry ingredients for recombination. 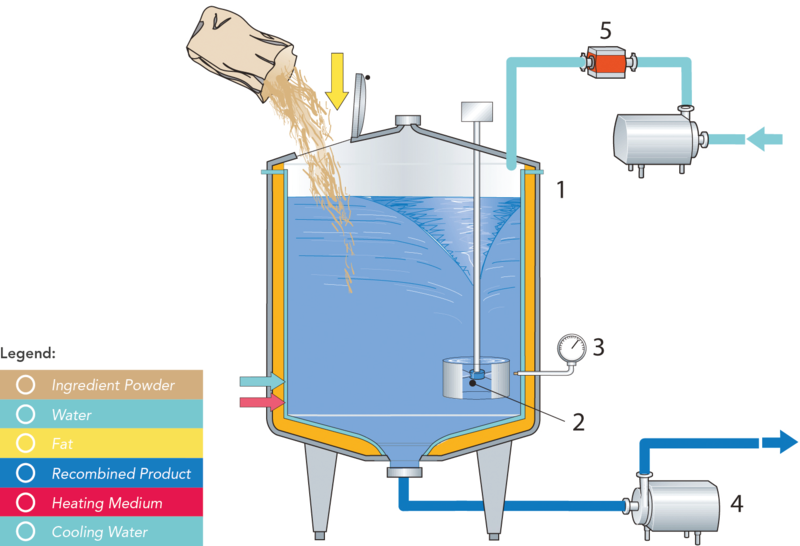 If the production requires the addition of oil, it is first measured in the weighing funnel, then store in the oil storage tank before it is added into the mixture. The agitator, specially designed for optimum oil dispersion, runs for several minutes and finely disperses the oil in the coconut blend. When all the ingredients have been mixed in one tank, the process is repeated in the next tank. The coconut blend and oil mixture is drawn from the full mixing tank by a pump which moves the mixture through duplex filters. This removes foreign objects such as pieces of string or sacking. After pre-heating in the heat exchanger, the product is pumped to the homogenizer, where the dispersion of oil globules is completed. During the powder-mixing operation, it may pick up large volumes of air, which can cause fouling in the pasteurizer and homogenization problems. To eliminate this, a vacuum deaerator vessel can be installed in the production line before the homogenizer. Alternatively, a high shear vacuum mixer can be used for the recombination process. Before the product is flashed in the deaerator, it is preheated to 7–8°C above homogenization temperature, with the vacuum adjusted so that the outgoing product has the correct homogenization temperature. Next, the homogenized coconut beverage is pasteurized and chilled in the plate heat exchanger then pumped to storage tanks for further processing or directed to packaging. For further processing, three methods are commonly used – pasteurization, in-container sterilization of coconut beverages and UHT treatment by direct or indirect heating. As such, the design of the plant is influenced not only by its capacity, but also by the recombination process. In smaller plants where the mixing of material in a processing tank is limited, the product will be naturally and satisfactorily deaerated if a reconstitution temperature of approximately 40°C is maintained. At this temperature, all the powder has been dissolved and the resultant solution is allowed to stand for 20 minutes with the agitator switched off. The same procedure should also be applied to large-scale pro- duction. In addition, the product is deaerated by vacuum treatment that is connected to the heating process. In the recombination of coconut water based beverages, the process is relatively simpler than the recombination of coconut milk based beverages. However, there is a set of critical factors to take note of. Normally, coconut water concentrate between the range of 16 - 65 °Brix is used. 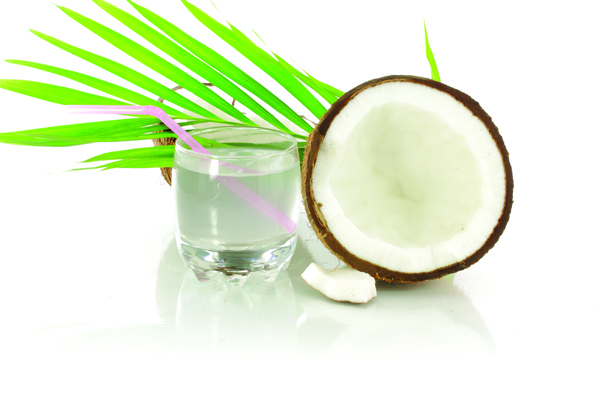 To reconstitute coconut water, coconut water concentrate is simply blended with water. Blending is recommended to be done cold to minimize any degradation reactions, such as browning and microbiological degradation. At this stage, other ingredients like juices and additives are also added. After mixing, the beverage is immediately fed to the heat exchanger for pasteurization, deaeration and chilling. It is then pumped to storage tanks for further processing (UHT) or direct to packaging. When handling recombined coconut beverages, it is necessary to ensure that the products reach consumers in mint condition. Firstly, the products should be packed as soon as possible after production. 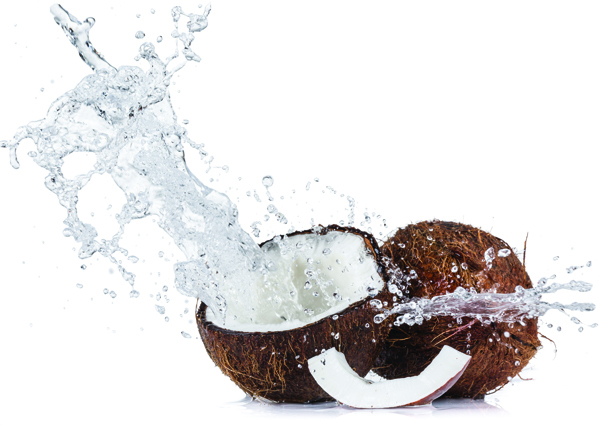 UHT treated coconut beverages must flow in a closed aseptic system to the aseptic carton or can filling machine. Pasteurized coconut beverages can be packed in paper-based laminates, plastic packs or glass bottles. For long life products, the package must always be airtight to protect the coconut beverages from oxidation. It should also be strong enough for stacking in crates or boxes. A buffer tank may be needed to compensate for temporary stoppages in the production or packing lines. In the case of sterilized coconut beverages, this tank must be of aseptic design to prevent reinfection. After packing sterile coconut beverages, they can be stored in any condition, provided that the packages are intact. Pasteurized coconut beverages must be kept in cold storage rooms, while UHT treated and sterilized coconut beverages can stand without a refrigeration chain. This is because the latter are much more tolerant of ambient temperature and other conditions than pasteurized coconut beverages. Last but not least, recombined coconut beverages are transported for market distribution. For UHT treated coconut beverages, the time factor is not too important as they can be transported over long distances and displayed for sale without refrigeration. On the other hand, when pasteurized coconut beverages are transported from place to place, they require a refrigeration chain of insulated distribution vans, chilled counters in the shops, and preferably, home refrigerators.